Janet King relaxes in her office, her dream catcher in the background. The dream of quality mental health care for many under served groups, including Native Americans, has been deferred too long. 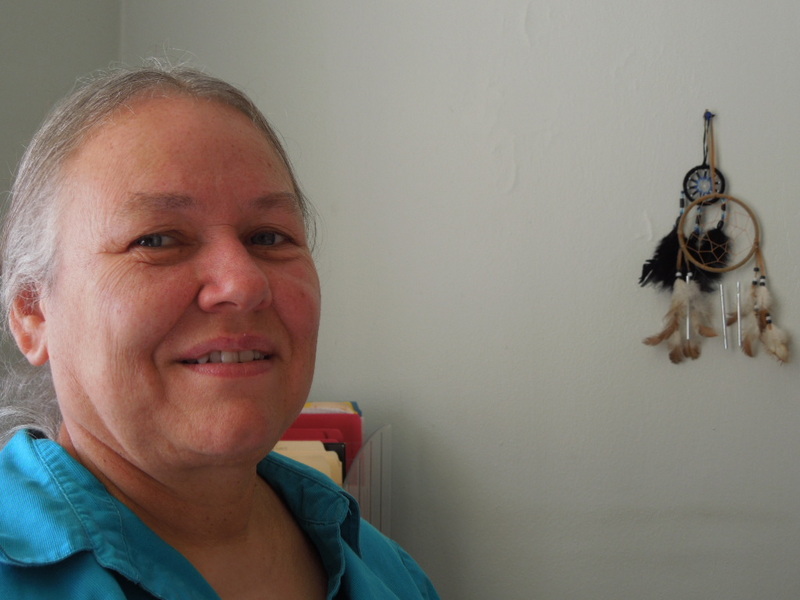 Janet King is one woman working to resolve some of those disparities in care, and make the dream of improved mental health and the well-being for Native Americans a reality at the Native American Health Center in Oakland. King, 55, works in the Community Wellness Department as the Project Director of the Children’s Trauma Grant, and her duties keep her very busy as she constantly responds to staff inquiries or her ringing cell phone tucked tightly in her pocket. “Interruptions help me clear my thoughts,” she says, the corners of her small azure eyes crinkling as she smiles and relaxes her shoulders. King has plenty to smile about. She’s just finished a large report for the NAHC bringing to light health care disparities among Native Americans in California. The California Reducing Disparity Report (CRDP) is a major first step because it suggests ways to close some of those treatment gaps. It was created in response to the Department of Mental Health’s statewide initiative to improve access, quality of care, and increase positive outcomes for Native Americans. Since 1972, the NHRC has worked hard to achieve these goals as a community-based organization. The health center provides a full range of clinical medical services including pediatrics, women’s health care, teen health care, adult medicine, and perinatal. The clinic also promotes self-care beyond clinical visits, which include offering a traditional Native American medicine person and healing circles, in addition to parenting classes, a relapse correction class and a woman’s support group. NAHC is dedicated primarily to offering Native Americans care that is aligned with their cultural traditions. But many community members that visit the clinic are non-Native. Many Latinas visit The Woman’s Support Group. The Women Infant and Child (WIC) class – which provides food vouchers and nutrition counseling – has mostly Vietnamese women, and there are many Tongans in the pre-natal program. Still, King sees the clinic as particularly vital to the East Bay’s Native communities. “Native Americans will not go to other places if they don’t go here,” King believes. She says that Native Americans commonly choose traditional mental health rooted in their communities’ traditions which embraces the whole self, like Two Spirit Pow Wows and Healing Circles and Gatherings, which aren’t typically offered in traditional medicine. Or the youth, who participate in the Gathering of Native Americans, popularly known as GONAs, which empower them through decision-making. 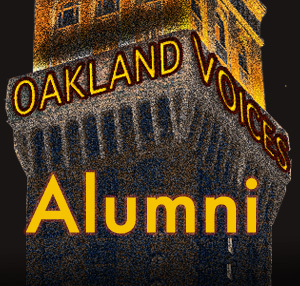 King, an Oakland resident since 1976, facilitates a grief and loss group. She is empathetic and understands the unique decisions community members have to make in deciding between clinical or non-clinical services. Many Native Americans in East Oakland choose not to use the clinic, and King thinks that is partly because the clinic doesn’t have a large staff and gets a lot of help from interns, so it’s not able to see patients as quickly as other facilities. King says there is a great need to find qualified Native American practitioners who can provide these services. Also, NAHC’s staff rotates frequently, and some individuals don’t like telling their stories over and over again to different people. Consumers rely on the groups for mutual support and guidance. “They become family to each other. They’re dealing with a lot of grief and loss. Every time they change counselors, it’s a loss,” King adds. Understanding the needs of the community in order to improve access, quality of care, and increase positive outcomes is a central role for community leaders like King in seeking to close health care disparity gaps. She says that the US Census under reports the size of the Native American population nationally, so those communities effectively become invisible to policy makers who base funding decisions on population size. Also, some people believe Native Americans don’t need funding or any money at all because they all have wealth from operating casinos. King explained that, until now, Native Americans were not often mentioned in mental health discussions and so the data on Natives was incomplete, obsolete, or non-existent. In its focus on providing traditionally-based health care services, the NAHC is already doing a lot of what the report calls for. Of course, funding for these practices, as mentioned in the report, is crucial in order to continue and expand these practices to other non-Native American ethnic groups that utilize their services as well. As the Native American Health Center and similar organizations continue to evaluate, customize, and listen to what communities want, the report will hopefully become more than just an opportunity to improve lives, but more personally, for King, a fulfillment of a dream. After study a few of the blog posts in your web site now, and I really like your method of blogging. I bookmarked it to my bookmark website list and can be checking back soon. Pls check out my web page as well and let me know what you think.